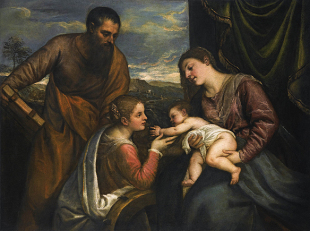 Titian, Sacra Conversazione: Madonna and Child With Saints Luke and Catherine of Alexandria, c. 1560. When Catholic America was 40 years younger than it is today, every parish church became absolutely quiet the moment Mass ended. Today, a buzz of talk begins almost immediately after the last note of the closing song is sung. A hundred conversations are already in full swing by the time most churchgoers reach the vestibule. The change must have occurred sometime in the 1980s, but it has been so little remarked upon that I cannot firmly date it. One moment–say, a warm Sunday afternoon in the mid-1970s–I was a boy attending Mass at St. Ann Catholic Church in San Antonio. I was made to understand that I was in the House of God; that the Body of Christ was present there in the Eucharist; and that, apart from prayers voiced and songs sung as part of the Mass, a complete, reverent silence must be maintained in the church at all times. Churchgoers who arrived before the Mass were presumed to be in prayer — and were often found kneeling to prove it. Those who remained after were understood to be in deep conversation with God–and obviously not to be disturbed by idle talk. Even small asides during Mass, however urgent they might appear, were highly unusual, and done so discreetly as to be almost impossible to notice. The next moment–say, another warm Sunday afternoon, now, perhaps, in the mid-1980s–the scene was dramatically altered. When Mass ended, no one (or virtually no one) remained in church to pray. And people felt free to talk on their way out, even to linger inside and converse at length, about anything. What had happened? Why the change? By way of explanation a thousand things could be said, or, for the moment, equally well left unsaid. These days, my family and I try to kneel in prayer for a couple of minutes after Mass ends. And it remains my preference (often honored in the breach) that we stay completely silent until we are outside the church. Am I self-righteous? Overly pious? A spiritual stuffed shirt? A self-conscious holier-than-thou? I sometimes feel that way, but I cannot take such questions seriously. I remember too well when the minutes following the end of Mass played out quite differently than they do now. Even so, I want to avoid all manner of fuddy-duddyness. So I sometimes imagine my talkative fellow Catholics are speaking of the things of God on their way out of the church–of their deep gratitude for his many gifts, particularly the gift of the Eucharist they have just received. I imagine that their unbridled chatter, so different from the Church’s former reverence, is really a new form of reverence–the chatter of saints. In the history of art, after all, we have the edifying tradition of the sacra conversazione–the depiction of saints in conversation with the Blessed Virgin Mary and the Christ Child. Any interaction among such personages would have the glow of holiness, wouldn’t it? Sometimes I imagine that my fellow parishioners are like those saints on canvas, their sanctity expressed in speech. All the parishioners I know lead godly lives, so this is not hard to do. And if I imagine that their words after Mass are not explicitly religious, I can counterimagine that their spiritual experience of Mass has been too rich for words, or best kept private and inward–hidden, in this case, behind a protective cloak of comments about the next spaghetti dinner, the parish scho0l sports teams, or one’s upcoming week of tasks and trials. I know that when I emerge from the church I quickly start talking about the same kinds of things. Would I prefer, for all that, a return to the Catholic Church’s former silence? Yes. But in the meantime, the chatter of the saints will do. I have discussed this item numerous times with Marie. There has been chatter even during Mass at the offertory. I have a hard time FULLY believing Jesus’ sacrifice at the altar is being made and I suspect others are at that same point in their lives. However, that needs to be cultivated, nurtured through silence. I just got an e-mail from our deacon quoting Mother Teresa: abortion would end if everyone would go to adoration an hour a week. Thanks for the reflections, Tony!